Digestion – receives food, preparing it for digestion in the stomach and small intestine. Communication – modifies the sound produced in the larynx to create a range of sounds. Breathing – acts as an air inlet in addition to the nasal cavity. In this article, we shall look at the anatomy of the oral cavity – its divisions, contents, and any clinical correlations. The oral cavity spans between the oral fissure (anteriorly – the opening between the lips), and the oropharyngeal isthmus (posteriorly – the opening of the oropharynx). It is divided into two parts by the upper and lower dental arches (formed by the teeth and their bony scaffolding). The two divisions of the oral cavity are the vestibule, and the mouth cavity proper. Fig 1.0 – The two divisions of the oral cavity are the vestibule and oral cavity proper. The horseshoe-shaped vestibule is situated anteriorly. It is the space between the lips/cheeks, and the gums/teeth. The vestibule communicates with the mouth proper via the space behind the third molar tooth, and with the exterior through the oral fissure. The diameter of the oral fissure is controlled by the muscles of facial expression – principally the orbicularis oris. Opposite the upper second molar tooth, the duct of the parotid gland opens out into the vestibule, secreting salivatory juices. The mouth proper lies posteriorly to the vestibule. It is bordered by a roof, a floor, and the cheeks. The tongue fills a large proportion of the cavity of the mouth proper. The roof of the mouth proper consists of the hard and soft palates. The hard palate is found anteriorly. It is a bony plate that separates the nasal cavity from the oral cavity. It is covered superiorly by respiratory mucosa (ciliated pseudostratified columnar epithelium) and inferiorly by oral mucosa (stratified squamous epithelium). The soft palate is a posterior continuation of the hard palate. In contrast to the hard palate, it is a muscular structure. It acts as a valve that can lower to close the oropharyngeal isthmus, and elevate to separate the nasopharynx from the oropharynx. Muscular diaphragm – comprised of the bilateral mylohyoid muscles. It provides structural support to the floor of the mouth, and pulls the larynx forward during swallowing. 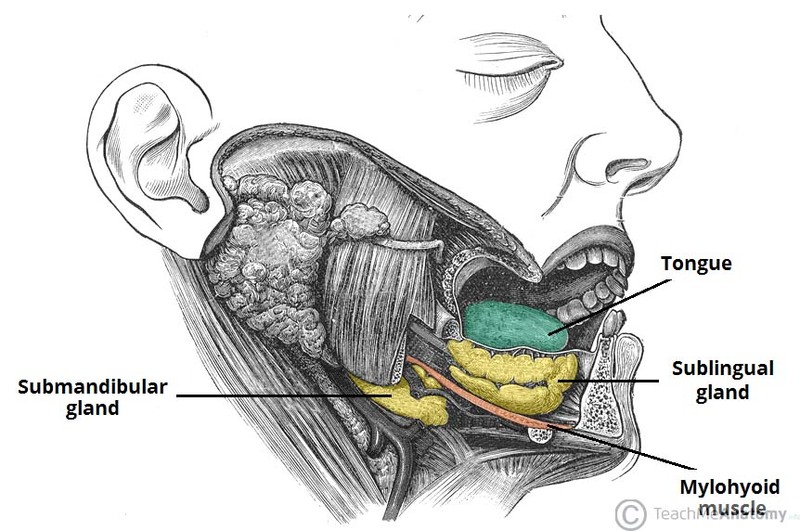 Geniohyoid muscles – pull the larynx forward during swallowing. Tongue – connected to the floor by the frenulum of the tongue, a fold of oral mucosa. Fig 1.1 – Structures of the oral cavity floor. The cheeks are formed by the buccinator muscle, which is lined internally by the oral mucous membrane. The buccinator muscle contracts to keep food between the teeth when chewing, and is innervated by the buccal branch of the facial nerve (CN VII). 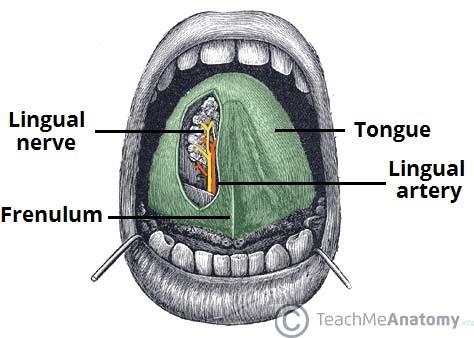 Fig 1.2 – The lingual nerve provides sensory innervation to the tongue. Sensory innervation of the oral cavity is supplied by the branches of the trigeminal nerve (CN V). The hard palate is innervated by the greater palatine and nasopalatine nerves, both of which are branches of the maxillary nerve (CN V2). The soft palate is innervated by lesser palatine nerve, another branch of the maxillary nerve. The floor of the oral cavity receives sensory innervation from the lingual nerve – a branch of the mandibular (V3) division of the trigeminal nerve. 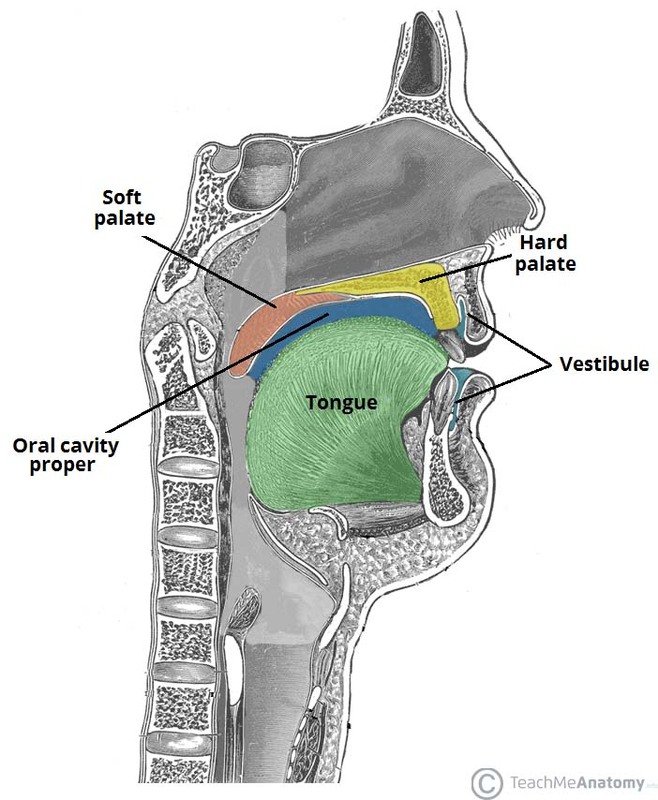 The tongue is also innervated by special sensory fibres for taste from the chorda tympani, a branch of the facial nerve (CN VII). The cheeks are innervated by the buccal nerve. It is also a branch of the mandibular division of the trigeminal nerve. The gag reflex is protective against foreign bodies touching the posterior aspects of the oral cavity, which are most innervated by the glossopharyngeal nerve (CN IX). When stimulated, a reflex arc leads to contraction of the pharyngeal musculature and the elevation of the soft palate. The efferent nerve in this case is the vagus nerve (CN X). What is the epithelial covering of the superior aspect of the hard palate? Which nerve innervates the buccinator muscle? 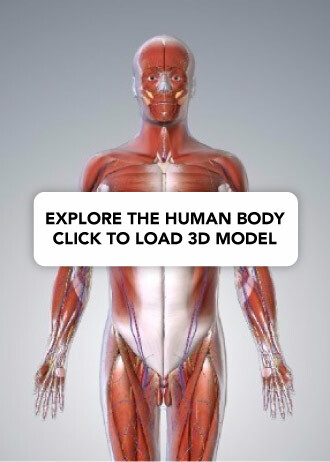 Which muscle largely controls the diameter of oral fissure?